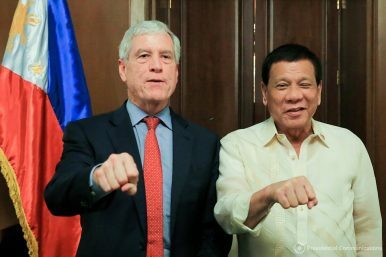 President Rodrigo Duterte flashes his signature pose with Australian Secret Intelligence Service (ASIS) Director General Nicolas Peter Warner who paid a courtesy call to the President in the Malacañan Palace on August 22, 2017. A Stronger Australia in Southeast Asia? Concerning regional developments have put Canberra’s role in the spotlight. Early next year, Sydney will play host to a special summit between Australia and the members of the Association of Southeast Asian Nations (ASEAN), which is commemorating its 50th anniversary this year. But as we approach that meeting, questions remain about what role Canberra should really play in Southeast Asia amid concerning developments within the subregion, vexing security issues in Asia more broadly, and uncertainty over the role of other powers including the United States. Australia’s position and standing as a wealthy, Western-oriented country in the region, one would think, would give it an advantage at the negotiating table where critical issues like North Korea and a potential conflict in the South China Sea will dictate the broader agenda. And some analysts continue to argue that the Australian government should take a more proactive stance with ASEAN, which is facing difficult times as individual members take unilateral action to silence dissent, upsetting civil rights groups and many in the West. Yet with ASEAN itself so hamstrung by internal divisions and Western countries beset by their own internal problems, it is difficult to see Canberra actually playing such a role on its own anytime soon. “Canberra has no real interest in challenging any of ASEAN’s burgeoning autocracies,” said Gavin Greenwood, a risk analyst with Allan & Associates in Hong Kong. Part of the problem is any consensus on the region remains beyond the distant horizon. Foreign policy wonks and those within the administration of U.S. President Donald Trump are justifiably obsessed with North Korea and its ballistic missile tests and have shown little interest elsewhere in the region. Meanwhile, the kind of initiative that the United Nations possessed in the 1990s, when UN expeditions were launched into Somalia, East Timor and Cambodia, among others – deeply problematic but with their share of successes too – is notably missing today. At least those in charge back then did try. Without the United Nations and United States on board, alternatives are few, as countries – once considered progressive when compared with authoritarian Singapore, communist governments in Vietnam and Laos, or an absolute monarchy in Brunei and junta in Myanmar – are stumbling. “On ASEAN, no one is arguing that it’s going anywhere fast,” said Keith Loveard, a risk analyst with Jakarta-based Concord Consulting Loveard, adding that China’s firmly established influence and its maritime ambitions in the South China Sea were further complicating regional politics. Nonetheless, Loveard admits that ASEAN is still there and requires some involvement to some degree. And that is where seasoned observers are urging Australia to play a more active role. Australia’s stakes in ASEAN are much higher than is often appreciated. According to the Australian Business in ASEAN Survey 2017, ASEAN accounted for 14 percent, or AUD$93 billion, of Australia’s total trade in 2015-2016 with total two-way investment valued at AUD$224 billion at the end of 2016. Conducted by the Australian chambers and business councils from within ASEAN, it found 61 percent of Australian firms had identified growing consumption among ASEAN consumers as the main reason for doing business in the region, ahead of improved infrastructure. Both figures showed a significant increase over the previous year. President of the Australia-ASEAN Chamber of Commerce Fraser Thomson said Australian firms wanted more information to properly understand what ASEAN regional integration could mean for their business. Barriers to ownership and investment, and a lack of skilled labor were cited as major impediments to operating in Southeast Asia with 42 percent of Australian businessmen saying they were challenged by corrupt practices in the region. Corruption ranked highest in Vietnam with 72 percent; Cambodia with 67 percent; Indonesia with 55 percent. In the Philippines, 52 percent of Australian businessmen ranked corruption as the number one issue among the 13 business challenges they identified. A further report officially launched in early October in Washington, D.C. found a lack of mutual trust and the absence of strong institutions in Asia has also contributed to growing instability in the region. The Asia Society Policy Institute also called for efforts to strengthen existing regional bodies such as ASEAN to help increase communication and prevent crises amid increasingly vulnerability to growing friction. Political leaders and diplomats, including former Australian Prime Minister Kevin Rudd, contributed to the report. “In the absence of greater transparency, technological advancements – are deepening mistrust between regional neighbors and leading nations to skew their own investments in an effort to hedge against other countries’ perceived advantages,” it said. Malaysia is engulfed by religious, financial and political scandals and has disturbing ties with the likes of North Korea, Iran, and in East Africa, Malaysia has been dubbed the continent’s silent partner. The coup in Thailand and lese majeste laws that can only dictate love and affection of a monarchy and the election of Aung San Suu Kyi in Myanmar have disappointed and defied expectations with the onset of civil conflict between the all-powerful military and ethnic Rohingya. Cambodia – one of the few countries of recent times to boast a free press and a democratically elected government – appears to be backsliding following the arrest of its opposition leader for treason and the closure of media organizations. It’s a situation not helped by the Philippines, where President Rodrigo Duterte typifies the attitude of much of the region by justifying atrocious behavior, including extrajudicial killings, as being within the parameters of the law. The European Union is one of the few voices to remain prominent in speaking up on issues ranging from the disappearance of Sombath Somphone in Laos to the latest ructions in Cambodia. Gavin Greenwood said that though Australia appears comfortable with the broad status quo with ASEAN, certainly in terms of economic relations, the real test will come in the area of human rights and democracy amid developments in Cambodia and Myanmar. Precedent suggests as close to the middle as possible, and that seems unlikely to change for now. “Australia’s support for the Philippines follows the conventional security matrix evident since Vietnam [War] when Canberra announced itself to be a follower of the US in the region rather than a leader,” Greenwood said. He said that, as a result, the recent offer to help the Philippine military in its fight against Islamist State-linked militants linked the Marawi siege can be justified without any reference to backing Duterte by promoting such support as a ‘forward’ defensive policy that has nothing to do with his anti-narcotics campaign. On appearances, that might enable Australia to have its cake and eat it too, an attitude to foreign policy that might be appealing for trouble spots across the region but unlikely to be of much help on the ground where ordinary people are suffering.